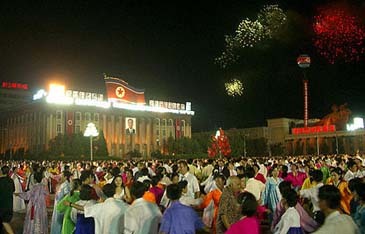 EBA members and other expats dancing with Koreans on the Kim Il Sung Square in the N. Korean capital of Pyongyang. A total of 18 European companies are participating at the European booth organized by the European Business Association (EBA) in Pyongyang. This has been the largest ever participation of European companies at a Trade Fair in Pyongyang. The 18 EBA-member companies come from 6 European countries and are engaged in banking, IT, pharmaceuticals, maritime transportation, railways, courier services, industry, mining, solar driven water pumps, energy saving technology, commodity inspection, cosmetics and other consumer goods and general trading. Some already operate in joint ventures with Korean partners or found other forms of close business cooperation, particularly in the fields of banking, mining, internet services, logistics, software development and pharmaceuticals. The EBA will continue to make efforts to attract more European companies to invest and do business in the DPRK in the coming years and will share its experience to help make the endeavors of the newcomers and their Korean partners a success. The EBA closely cooperates with the DPRK Chamber of Commerce and the Korea International Exhibition Corporation to facilitate the participation at exhibitions, to intensify trade between European and DPRK-enterprises and to enhance the identification of suitable business and investment opportunities for European companies.